When I started Classic Fountain Pens as a business in 1994, I was working out of my one-car garage re-tipping nibs and restoring vintage flea market pens while also teaching sculpture at Otis Parsons School of Art. My poet friend Rolly told me that I should have a web site for my new business. I hardly knew what that was, so I consulted my daughter’s then-boyfriend, who said he would make one for me. He put up a few pages and told me how to put up more. That was how the nibs.com website was born. The simple 1970's-era industrial building on the outskirts of Bologna, Italy, has an unassuming appearance from the outside. But inside this factory work- shop, some of the most skilled artisans and craftspeople in Europe are handcrafting Omas fountain pens, which have become treasured by pen aficionados all over the world. 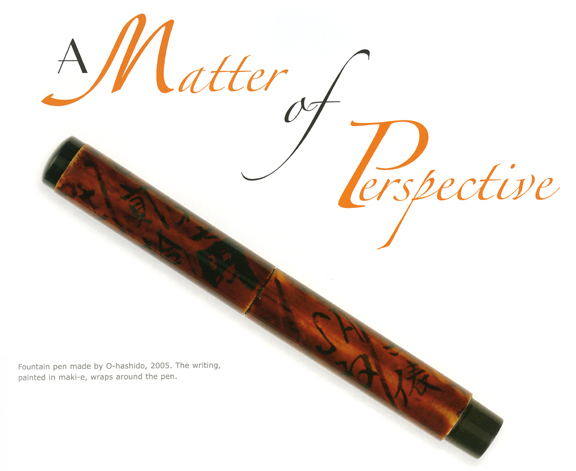 A New Perspective on Japanese Fountain Pens: Observations on Lambrou and Sunami’s “Fountain Pens of Japan”. 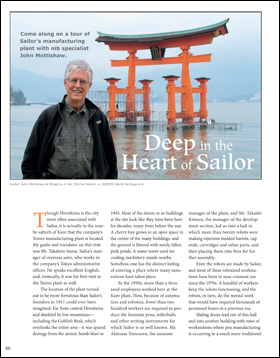 John Mottishaw demonstrates how a new book reveals Japan's extraordinary achievements in pen artistry. Though Hiroshima is the city most often associated with Sailor, it is actually in the nearby suburb of Kure that the company’s Tenno manufacturing plant is located. My guide and translator on this visit was Mr. Takahiro Inoue, Sailor’s manager of overseas sales, who works in the company’s Tokyo administrative offices. He speaks excellent English, and, ironically, it was his first visit to the Tenno plant as well. A recent pen clinic in Los Angeles, co-sponsored by my company, Classic Fountain Pens, and Itoya Inc., the North American distributor for Sailor pens, gave West Coast pen enthusiasts a rare chance to meet Yukio Nagahara, Sailor's chief nib designer. Nagahara also shares the responsibility, along with his father, Nobuyoshi Nagahara, of personally handcrafting each of Sailor's specialty nibs. These are called Nagahara nibs in honor of their development by the elder Nagahara. In January of 2008, while in Tokyo, John was interviewed by MONO Magazine, a glossy and upscale monthly magazine. The article, a special feature appearing on page 125, was translated for us by Leon Lim, and appears below. "The True Mettle of Japanese Pens"
Read more about Why Use Gold Nibs? If a person enjoys writing with a fountain pen, it is probably for several reasons. High on the list is the feel of pen on paper, as it glides effortlessly across the surface. Writing with a scratchy nib, on the other hand, is a less than pleasing activity. Anyone who uses fountain pens regularly has had this other experience. The nib is an elegant answer to a question of aesthetics and function. It has a characteristic shape that, with a few notable exceptions, has remained very much unchanged for one hundred years. As the big BMW pulled away from our hotel in Frankfurt, the driver thoughtfully asked if traveling on the autobahn at speeds over 200 kilometers per hour (125 mph) would be uncomfortable for us. We looked at one another, grinned like two kids in a candy store, and replied in unison, "No problem!"